How Risky Is General Electric Stock? Is the worst over for General Electric, or should investors still stay on the sidelines? General Electric (NYSE:GE) is an iconic industrial company with a storied history that spans more than 100 years. It has been through lean times before and is once again struggling through a rough patch. It is likely to survive, but that doesn't mean that investors should buy the stock today. Here's a quick look at the risks facing General Electric shareholders. GE's current troubles today trace their history back to Jack Welch. Some might consider that statement a heresy, but it was under Welch that the industrial giant allowed its finance arm to expand well beyond its primary role of providing financing to GE's industrial customers. When the 2007-2009 recession hit, General Electric's exposure to things like mortgage lending took a painful toll on the company. There were write-offs, asset sales, a dividend cut, and even a government bailout. All of that happened under Welch successor Jeffrey Immelt, but the seeds of this trouble were sown on Welch's watch. The company is now on its third attempted turnaround at this point, as Immelt's efforts to right the ship weren't enough. His successor, insider John Flannery, also instituted write-offs, asset sales, and a dividend cut, but only got about a year or so on the job before he was replaced. At this point, outsider and former Danaher CEO Lawrence Culp is at the helm. It shouldn't be too surprising to find out that the fix this time includes write-offs, asset sales, and yet another dividend cut. The dividend at this point is a token $0.04 per share a year. That's largely to ensure that institutional investors with a dividend mandate can continue to own the stock. So what does the situation look like at this point? 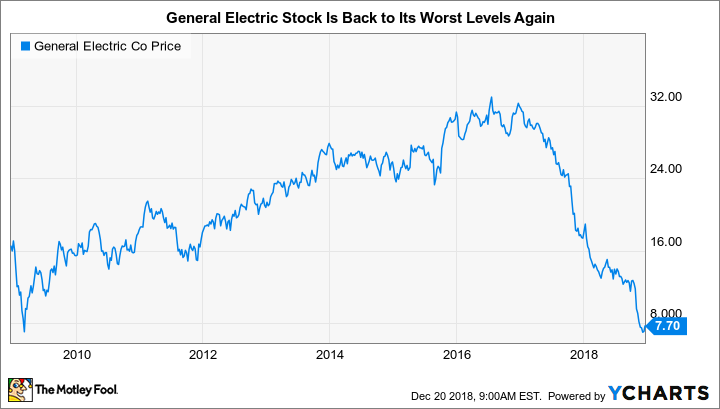 For starters, General Electric stock is down roughly 60% so far in 2018. The shares are lower by nearly 80% over the past three years. It has been a really tough stretch for investors. That said, with a stock price in the $7-per-share range, GE is trading at about where it did during the worst of the 2007 to 2009 recession. A lot of bad news has been priced in. In fact, GE is still a very important industrial conglomerate, with material operations in the energy (power turbines), aviation, and healthcare industries. The company generated roughly $30 billion in revenue in the third quarter alone. The truth is that GE is likely to survive in some form. That, coupled with the massive stock price decline, suggests there is material turnaround potential here. And there is...but only for investors who can handle a very rough ride. Although the company generated $30 billion in revenue in the third quarter, it also had a $22 billion write-off that pushed earnings deep into the red. That's supposed to get things headed in the right direction again, but so were the last two big write-offs. If you are a risk-averse investor, you should avoid GE. 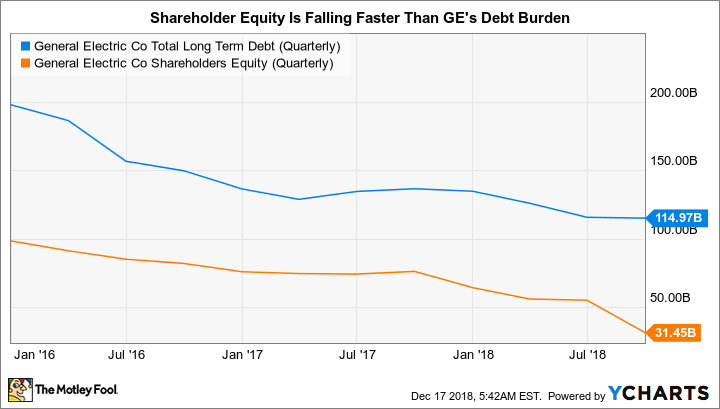 GE Total Long Term Debt (Quarterly) data by YCharts. That fact is highlighted by the company's balance sheet. At this point, long-term debt makes up around two-thirds of the capital structure (including noncontrolling interests in shareholders' equity). That's a little high when you consider that GE operates in a highly cyclical industry. Further noncash charges, meanwhile, could make that number even worse. Yes, asset sales will help to pare debt, which is down about 10% from the start of 2018, but dispositions could also come with additional writedowns, since GE is selling from a position of weakness and everyone knows it. In fact, in one of Culp's first interviews, he sounded a very cautious note about the company's leverage, spooking investors and sending the shares swiftly lower. That interview, in fact, gets to the heart of the issue. There is a known problem (too much debt and struggling operations) and a broad idea of what a solution will look like (asset sales and debt reduction), but it's still very unclear as to what the actual steps of a turnaround will be. For example, the company sped up its divestiture of Baker Hughes, a GE Company (NYSE:BHGE) at a weak point for that energy company's shares. That's led some to wonder if GE is getting desperate, since it is easy to argue that waiting until the oil drilling industry was recovering would have been more prudent. It would have, at the very least, resulted in more of a financial reward. Adding to that feeling of desperation is the fact that GE is also talking about spinning off a piece of its healthcare division. That's arguably one of its best businesses and something that it wouldn't do unless it had few other options. This is not a company operating from a position of strength, with the need to fix an overleveraged balance sheet the driving force of change right now. A further complicating factor is that what remains of the GE's finance arm is still something of a black box that is continuing to weigh on financial results. In fact, nearly half of the company's long-term debt is attributable to this deeply troubled division. It's hard for investors to pin down just how big or small the risk is within the finance arm. There are a lot of moving parts at General Electric today. It is operating from a position of weakness as it tries to mend a heavily indebted corporate balance sheet. Although the company will likely get through this period, what it looks like on the other side is still unknown. Investors with strong constitutions that like special situation stocks might want to dip their toes in because of the opportunity for capital appreciation if Culp can work some turnaround magic. However, most investors would be better off avoiding GE until there is evidence that, this time, the turnaround is going to take hold. GE is just too risky for all but the most aggressive investors today.